Welcome to episode 31. 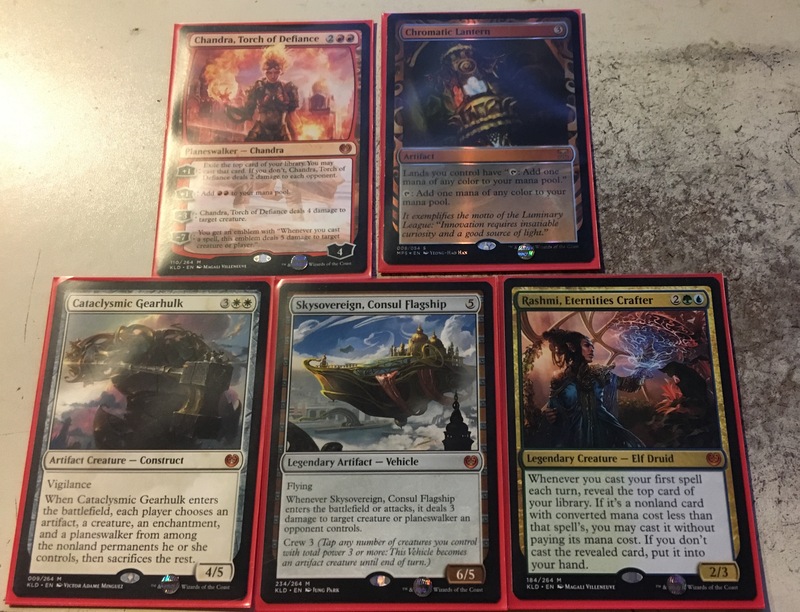 I discuss my thoughts on Kaladesh, the prerelease, what I pulled from my box of Kaladesh and my prerelease deck. Welcome to episode 30, I discuss the Eldritch Moon prerelease, some new decks I’ve built and more. Here is the deck I used during the Eldritch Moon prerelease event. Welcome to episode 29. I discuss the new Kaladesh set, Planeswalker decks and more. Welcome to episode 28, I discuss the Shadows Over Innistrad prerelease, BREAD drafting and more. Welcome to episode 27, we discuss Christopher Rush, the Modern Eldrazi decks, some Shadows Over Innistrad spoilers and more. Welcome to episode 26, we talk a bit about the Oath of The Gatewatch prerelease, some EDH and Modern bans and more. Welcome to episode 25. We talk about some Oath of The Gatewatch spoilers, Shadows Over Innistrad, the Holiday gift box and more. Nettle Drone(Battle For Zendikar) – Can be used in infinite combos. Welcome to episode 24. We talk about the Battle For Zendikar prerelease, the buy a box promo, the recent banned/restricted announcement and more. Sealed gameplay tips to stay organized. Welcome to episode 23, we discuss more Battle For Zendikar spoilers, the return of full art lands, new Planeswalkers and more. Welcome to episode 22. We discuss Battle For Zendikar, the holiday gift box and more. How to handles lands that damage you when they are used for mana. Welcome to episode 21. We discuss the San Diego Comic Con panel, Commander 2015 and more. Welcome to episode 20. We discuss the Origins prerelease, the new Planeswalkers, 2-block sets, and more. Welcome to episode 19. We talk some Modern Masters, Origins spoilers and more. The stack and how it works. Welcome to episode 18, we announce out contest winners, talk a little about Magic Online, Commanders from Modern Masters 2015, and more. Mana manipulation and how to get the mana you need when you need it. Welcome to episode 17. We look at some players who have been banned from the Pro Tour, talk moe about Tiny Leaders more. Our card design contest is still going, go here for the rules. Welcome to episode 16. We look at some things from the Dragons of Tarkir pro Tour, Khans of Tarkir in Duels of The Planeswalkers 2015, Tiny Leaders and more. We’re having a contest. For this contest head over to MTG Cardsmith and create a card. The only rules for this contest are if you use pre-existing artwork please give proper credit in your e-mail entry. Also try to balance your cards. We want the cards being submitted to feel like something Wizards of The Coast would actually print. For example don’t make a 20/20 creature with haste and lifelink and have it only cost one mana. Once you create your card save it to your computer and e-mail it to us. Send all entries to onthestackshow@gmail.com and put Contest in the subject line. Give us a little information about your card and if you used other artwork please say so in your e-mail. For example if you use a picture of Captain America just say that Captain America is property of Marvel. We will be accepting entries until May 12th. prizes will be given for 1st and 2nd place. Welcome to episode 15. We discuss some upcoming Pro Tour events, look at some Dragons of Tarkir prerelease decks and more. Welcome to episode 14, we discuss some rule changes, new banned and restricted cards, look at the new judge promos and more. Welcome to episode 13. This week we have a very special interview with Broken Science Productions and the team behind the documentary film Mile High Magic stick around after the interview for our regular episode. Welcome to episode 12, we discuss the Dragons of Tarkir spoilers, Magic at PAX East and more. Making proper use of cards that return creatures to a player’s hand. Welcome to episode 11. We discuss the new duel deck, Tempest Remastered, wrap up Commander month and more. Artifacts in Commander, picking artifacts that work with your deck theme. Welcome to episode 10. We discuss the newly announced From The Vault set, how well Magiv sold in 2014, Commander Month continues and more. Commander Month continues and we discuss how to select your lands for your deck. Welcome to episode 9. We discuss Magic Origins, look at some changes to the World Championships, continue with Commander Month and more. February is Commander month and we look at some of the staples of Commander. We talk in depth about Sol Ring. Welcome to episode 8. We talk about the new Wizards employee play policy, the San Jose winning decks, look at staples of Commander and more. We’re giving away a copy of Magic Duels of The Planeswalkers 2015 and the Garruk’s Revenge expansion on Steam. Fill out this form to enter. 1 entry per person please. Winner will be randomly selected next week. February is Commander month and we look at some of the staples of Commander. We talk in depth about Reliquary Tower. Welcome to episode 7, we discuss the Super Sunday Series, entire booster boxes of fetch lands, we look at Todd’s deck and more. Welcome to episode 6. We discuss the Fate Reforged prerelease. The new bannings and unbannings, the new Fate Reforged intro packs, Magic and marriage, and more. Can Too Much Magic Ruin A Marriage? The answer to both questions is no since the Desert Twister and the damage from the Thorn Thallid are green they won’t work on a creature with protection from green. Some interesting articles on cards with protection: MTG Salvation and Essential Magic. Welcome to episode 5. We look at some information on the Fate Reforged Prerelease, talk about Indestructible permanents, look at Mike’s mono white Commander deck and more. Welcome to episode 4. We look at some new Fate Reforged keyword abilities, talk about Commander, look at Mike’s latest deck and more. Should Wizards Do Away With The Reserve List? Welcome to episode 3. We have some news about Fate Reforged, some strategy talk and we look at one of Todd’s vintage decks. 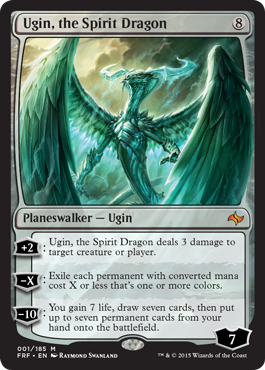 Ugin, The Spirit Dragon…The Real One. Here Is The Fake One We Discussed Last Episode. Listen to Standardized after the show, hosted by Jesse B. Hannah. Welcome to the second episode. We discuss some of the latest news, strategy and deck reviews. The show is now available on Stitcher for mobile devices. Welcome to the very first episode of On The Stack. On this episode we discuss how we got into Magic as well as news, card/strategy, deck reviews and more. Patrick Chapin (Abzan Midrange) vs. Shahar Shenhar (Sidisi Whip). Shahar repeats as World Champion. Treasure Cruise and Jeskai Ascendancy, we discuss strategies on how to play against these cards. Here is a good article discussing many ways to handle Jeskai Ascendancy.